Discovering Historic Pittsburgh: 841 Suismon St. 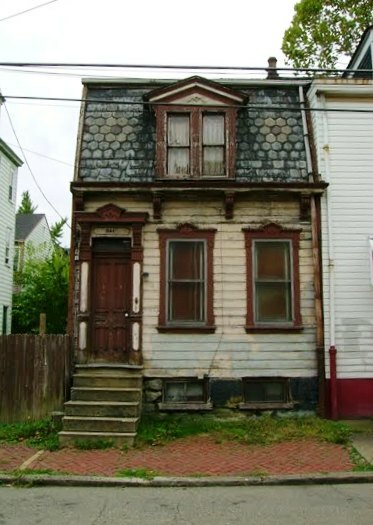 This house is located at 841 Suismon St. in Pittsburgh's Deutschtown neighborhood. It is located east of the highway, in the part of the neighborhood that has not yet been revitalized, yet it is still quite safe. I fell in love with this house when I noticed it while driving through the neighborhood a few years ago. Earlier this year, I wrote to the owner, asking to buy it. It turns out that the house is now in the deceased owner's estate, which is controlled by the Sikov and Love law firm in Pittsburgh. They were interested in selling the house and had a realtor show me the property. Unfortunately, the house needs a complete rehab as there is interior water damage. It would be a major undertaking, yet the house is absolutely worth it. It's an architectural gem. Unfortunately, I was unable to afford the restoration so I did not buy it. If you are interested in the house, I would urge you to enquire about 841 Suismon St. with the Sikov and Love law firm. I think we would all love to see this house saved. UPDATE: 841 Suismon Street was demolished as of June 22, 2013.